Dazzle your friends and family with a sparkling Gem Set gold Claddagh Ring. Our selection of gem set Claddagh rings include many different styles and designs. The gem set Claddagh rings include diamonds, rubies, emeralds, sapphires, cubic zirconia, topaz and quartz stones. These precious and semi precious stones are set beautifully in each ring which are made of 9kt, 10kt and 14kt yellow and white gold. The assortment of rings includes many different colours, so you have a wide variety of choice. The Claddagh ring is a uniquely designed ring that became famous throughout the world for its meaning. The ring shows two hands, holding a heart and the heart is topped by a crown which means the giving of your love and crowning the love with your loyalty. The Claddagh is a beautiful ring and is often given to family members, partners or friends to show your love for them. 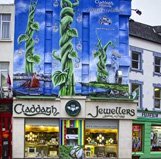 Claddagh Jewellers has sold thousands of rings worldwide since the launch of our first website in 1996. The company has gone strength to strength since it began operating in 1967. Product quality and customer service is our main concern, so you will always receive the highest quality product and an exceptional customer service experience.